1. Collect the opinions of employees and customers anonymously 2. Collect the opinions of members from an organization 3. Spot mentoring with a professional coach, that is a suitable fit for your company and management staff. 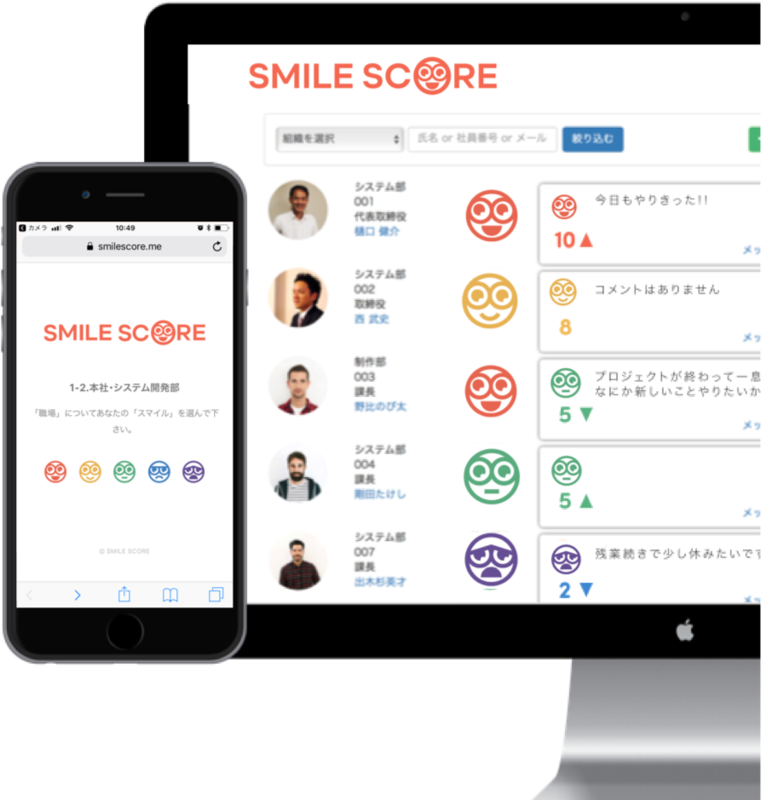 We developed our service, Smile Score, in order to help companies to evaluate the current well-being of their employees and teams. The service also helps to address employees' issues or concerns within their organization and assists businesses that are striving for healthy organizational growth. The planning and development of Smile Score. To live our lives and create many smiles within organizations. We’ve begun to make introductions to expanding VCs and listed companies in both Tokyo and Fukuoka. While we are highly regarded by founders and managers who wish to keep improving their companies without disregarding their employees’ feelings, we are also striving to better our service at the same time. In the future, we plan to deploy overseas. We are also working to inform overseas enterprises about our service by participating in “Innovex” which is Asia’s largest startup event held in Taiwan, as well as presenting at booths in Silicon Valley. In the future, we plan to create an English homepage for marketing and informational purposes. Startups in Fukuoka should be proactive in the domestic market as well as in international markets. This matchup service is an encouraging system for Fukuoka-based startups. Investors Invested more than 10 million yen from listed company CVC and angel investor. Key people at SMILE SCORE INC.